Mandibular third molars have always been an enigma for oral and maxillofacial surgeon. This is a report of an unusual finding which has been one of its kind and hence named helicopter tooth–a new anatomical variant of third molar. The source of data for the review on variance of impacted mandibular third molar has been PubMed, Medline and all the research studies and published reports. Impacted mandibular third molar as presented in this report in a 28 year old male patient had an unusual interesting finding where the roots presented in a mesiodistal direction and resembled the blades of helicopter. The variance of its anatomy was a challenge for securing local anesthesia. This interesting presentation will certainly embark for a new discovery of anatomical change in impacted mandibular third molar. Impacted mandibular third molar, Variation, Anatomy, Morphodifferentiation. Variations during morphodifferentiation of tooth germs may be observed in the permanent dentition. Root abnormalities are classified as dilaceration, extra root formation, double root formation, concrescence, rizomegali and hypercementosis . Trauma, altered tooth germ position and delayed tooth eruption have been hypothesized as possible causes of tooth root dilacerations and flexion. These anatomical variations appear more commonly associated with posterior teeth and absence of traumatic history. It is plausible that during the physiologic and growth related alteration of the alveolar and basal bones, portions of developing tooth could be found within one or more of the plasticity zones, contributing to alteration of the root sheath and tooth root dilacerations . Here we present the first time reported impacted third molar with an new anatomical variant of root in a horizontal mesiodistal direction and hence named “helicopter tooth”. Mandibular third molars with the presence of different pulp canal running in a mesiodistal direction with the roots has been rarely reported in literature. 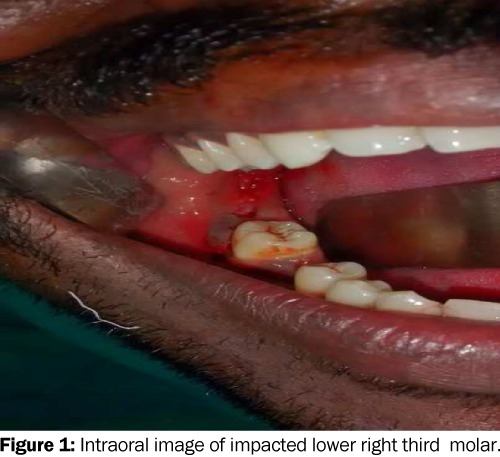 A 28 year old male patient reported to department of oral and maxillofacial surgery, Dr. D. Y. Patil Dental College and Hospital, Pune with chief complaint of pain in the lower right posterior back tooth since one month (Figure 1). Figure 1: Intraoral image of impacted lower right third molar. On clinical examination the region of 48 appeared to be inflamed with respect to the distal gingiva of 47. The diagnosis of pericoronitis was made clinically. The orthopantogram was taken to evaluate the status of the impacted teeth of all four quadrants. The orthopantogram revealed an unusual anatomy with respect to the anatomy of the impacted 48 (Figure 2). Figure 2: Unusual anatomy of lower third molar –Helicopter tooth. The roots with respect to the crown had an unusual shape which resembled the blades of helicopter (Figure 3). 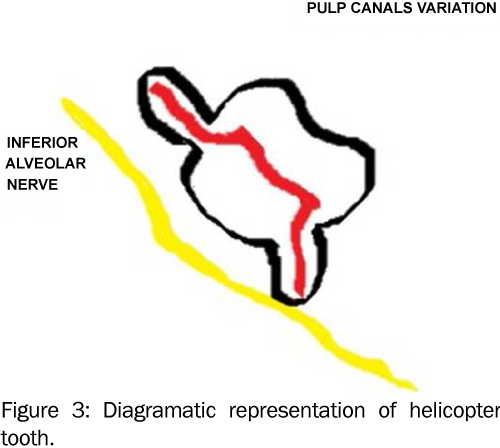 Figure 3: Diagramatic representation of helicopter tooth. The surgical removal of the tooth was planned under local anesthesia after taking written informed consent from the patient. Modified Ward's incision was given on the right posterior from 46 to distal of 47. The mucoperiosteal flap was reflected. The patient had to be given two inferior alveolar nerve blocks due to the change in the anatomical roots. The bone guttering was done with respect to the buccal bone. The tooth sectioning and delivery of the tooth was achieved. The toilet of the cavity was done, adequate hemostasis was achieved and the flaps were sutured with 3-0 silk interrupted suturing. The patient recovered without any complications postoperatively. Tooth root development involves the two way interaction of dental epithelium and ectomesenchyme which are mediated by a series of signals, from TGF-β, Bmp, Wnt, Shh, Fgf and other molecules, and by the function of homebox genes, such as Nfic and Msx1/2 . In order to overcome these failures and to manage anatomically differentiated roots, the surgeon must carefully investigate radiologic examinations from different angles. The anatomical variation poses a challenge to the surgeon to secure anesthesia. This report brings to light newer variation in impacted mandibular third molars. Mandibular third molar variation in anatomy and position as demonstrated in this case resembling that of a “helicopter” was concluded. The exact presurgical clarification of the anatomy certainly reduce the rate of complications for the risks associated with this procedure. The patient always report with certain chief complaints of pain, swelling associated with third molar indicating the need for removal of the impacted third molar surgically. 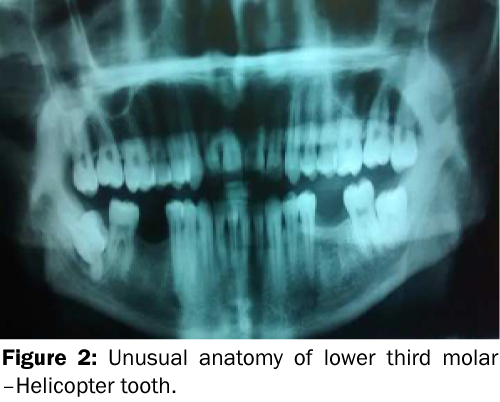 In this case patient reported with pericoronitis in relation to 48. Pericoronitis is a mild to moderate inflammatory response of soft tissues surrounding a partially erupted tooth, and 25 to 30 percent of impacted third molars are extracted because of acute or recurrent pericoronitis . Evidence-based clinical data developed from prospective investigations have shown that an asymptomatic third molar does not necessarily reflect the absence of disease . In our case due to patient’s financial constraint we could not evaluate the tooth three dimensionally. The new anatomical variant that was seen were the angulation of the roots to the crown which resembled the blades of a helicopter and hence named “helicopter tooth”. The literature search revealed that this case has been unique in its presentation. Due to patient’s preference for local anesthesia the surgical procedure was performed. The decision was hence taken to surgically remove the tooth under local anesthesia. Similarly Sammut et al. in their retrospective analysis to predict the choice of anesthesia for third molar surgery found that socioeconomic deprivation may be the cause for patient decision.In their study 37.7% patients were listed for general anesthesia and 42.4% for local anesthesia. Schneder et al. concluded in their retrospective analysis that mandibular third molar teeth had one (21.3%) or two (55.3%) roots, three (17.6%), four (2.0%) or five (0.2%) roots. In 31.4% of the teeth, the root perforated the lingual compact bone, and in 4.3% the vestibular compact bone. 44.4% of the teeth had mesial angulation, 9.7% distal angulation, 35.3% lingual and 2.9% buccal angulation. Park et al. concluded that there was a high prevalence of twoÃ¢ÂÂ rooted and oneÃ¢ÂÂ rooted mandibular third molars in Korean population with prevalence of C shaped root or radix ento molaris. In our case the angulation of the root with the crown significantly reflects a new enlightening variant. This variation in the root anatomy certainly gave us a challenge to secure local anesthesia. Yamaoka et al. found the relation between the root angulation and impaction, angulated roots were more common in impacted mandibular third molars as compared to erupted mandibular third molars. The commonly occurring anomalies of the shape of the tooth include dens invaginatus, talon cusp, dens evaginatus, gemination, fusion, root dilaceration, Taurodontism and concrescence . Our case has been unique where the tooth on the orthopantomograph showed the flared roots from the cementoenamel junction mesially and distally in a curved manner resembling the blades of a helicopter. Third molars differ from other molars in more aspects. It is the most variable tooth in dentition with respect to size, time of formatting and time of eruption . An unusual case of Radicular dens invaginutus with extra oral sinus also has been reported by Sabhlok et al. . This case thus depicts a revolutionary change in its presentation as a impacted mandibular third molar or as commonly said wisdom tooth. The mandibular third molar has been a tooth of great variance interms of its crown, roots and position. This case embarks an new variant never reported in literature which will be a guide to every maxillofacial surgeon for its surgical management.The patient has been on a follow of one year and has reported no complication postoperatively. This case is unique in its presentation and never reported in literature where tooth resembles “helicopter”. The root crown junction is altered and the position of the root location is altered and never reported. The variance in its root alteration was a challenge to secure anesthesia. The written informed consent was obtained from the patient for the publication and accompanying images. Aslan A, et al. Various root abnormalities. Report of 3 cases.N Y State Dent J. 2008;74:41-43. Standerwick RG. A possible etiology for the dilaceration and flexion of permanent tooth roots relativeto bone remodeling gradients in alveolar bone. Dent Hypothesis. 2014;5:7-10. Huang XF and Chai Y. Molecular regulatory mechanism of tooth root development. Int J Oral Sci. 2012;4:177-181. Rakprasitikul S. Pathologic changes in the pericoronal tissues of unerupted third molars. QuintessenceInt. 2001;32:633-663. Steed MB. The indications for third-molar extractions.JADA. 2014;145: 570-573. Schneider T, et al. Variations in the anatomical positioning of impacted mandibular wisdom teeth and their practical implications.Swiss Dent J. 2014;124:520-538. Park JB, et al. Evaluation of number of roots and root anatomy of permanent mandibular third molars in a Korean population, using cone-beam computed tomography. Eur J Dent. 2013;7:296-301. Yamaoka M, et al. Incidence of inflammation in completely impacted lower third molars. Aust Dent J. 1997;42:153-155. Sasso A, et al. Secular trend of earlier onset and decelerated development of third molars: Evidence from Croatia. Forensic Sci Int. 2015;249:202-206. Levesque GY, et al. Sexual dimorphism in the development,emergence, and agenesis of the mandibular third molar. J Dent Res. 60;1735–1741. Sabhlok S, et al. Radicular Dens Invaginatus in Mandibular Third Molar: ARare Case Report.International Journal of Oral & Maxillofacial Pathology. 2012;3:44-47.